Used for inlay machining by attaching a bit of 4 mm in shaft diameter to a 6 mm trimmer. I was saved because I could use it without problems. This review is about item#2016296. It is very convenient to use 3 mm shaft end mill with 6 mm collet. Can be used without any problem. I broke up with a mistake in working the other day, but it is saved because it is cheap. This review is about item#02016287. If you use Core for Proxon's No. 27000 milling machine, end mills other than shank diameter 6 mm will be available. It is very useful because it allows variations of the end mill to be chosen. MODELA MDX - 15 's standard spindle unit (shank wrench 6 mm) makes it possible to use tools with a shank diameter of 3 mmm, which makes it useful. 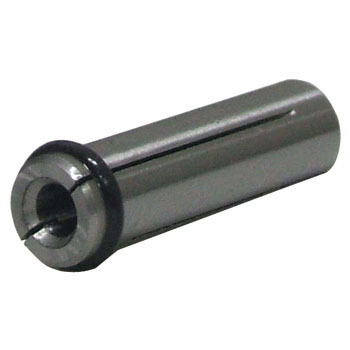 We attach 6 mm sleeve to 8 mm collet chuck of woodworking router, attach this product to this sleeve, attach 3 mm axis diamond bar and use it for detail cut of stained glass. Although it was cutting with a diamond bar of 6 mm axis, using this straight collet makes it possible to use more precise machining because the 3 mm axis diamond bar can be used. I had quite a bit of hesitation to use double sleeve (8 → 6) and straight collet (6 → 3), but it worked without problem. It is a way to use it unexpectedly by the manufacturer, but it is a very grateful product for me.